If you've got your own little monkeys in your life, you'll understand how important it is to have beautiful yet durable children's clothes. With a Polarn o Pyret discount code, you can enjoy fantastic savings on a wide range of clothing and accessories for ages newborn to 12 years. So whether you're getting a whole wardrobe for a new arrival or some smart clothes for a first day at school, a Polarn o Pyret voucher can help you save the pennies. Polarn o Pyret started life in Sweden in 1976 at a time of liberation and equality. To reflect this, the company began making quality, non-restrictive clothing that was designed to let children be children. Today, they supply a wide range of children's clothing and accessories to parents around the world. At Polarn o Pyret they believe that kids are kids – not mini adults. As such, all of their ranges are created with children in mind. They're built to withstand play and adventure in all weathers, and avoid gender stereotypes by using unisex colours and prints. They also make life easier for busier parents by being easy to care for and durable – designed to be handed down through the generations and worn by as many children as possible. Polarn o Pyret make clothes that children can be comfortable in, using a combination of snug cottons and durable weatherproof materials to ensure that the rain never has to stop play. Designed to keep children warm, dry and cool when they need to be, Polarn o Pyret's clothing also fits great without being tight or restrictive – just what active children need. An environmentally conscious company, Polarn o Pyret believes in looking after the earth from creating clothes that are designed to be reused again and again to using eco-friendly materials such as organic cotton. Their unisex colours and patterns increase their chances of being handed down and reused, and the company is the best-selling label on the second hand clothing market in Sweden. At Polarn o Pyret's comprehensive website customers can browse a wide range of clothing for children from ages newborn way up to 12 years of age – and everything in between. From comfortable bodysuits that are soft on a newborn's skin to outerwear and rainwear for older children that love the great outdoors, there's something for all the little monkeys in your life. Want to get shopping with Polarn o Pyret? With a Polarn o Pyret discount code you can enjoy great savings on their wide range of clothing for children and infants. So whether you've got a new arrival on the way or you need comfortable, durable clothing for a growing brood, a Polarn o Pyret voucher will save you money while you shop. Dedicated environmentally conscious company committed to recycling and eco-friendly production. Browse our website until you find a Polarn o Pyret discount code that suits you, then navigate to their website to begin shopping. Enter your Polarn o Pyret voucher in the box provided and click 'Apply voucher'. Want to find out more about quality kids' clothes built to last with Polarn o Pyret? Why not check out the company's dedicated YouTube channel? You'll find lots of exclusive content including new collection previews, behind the scenes features and more. You can also use this channel to find out more about saving money with a Polarn o Pyret voucher. If you've enjoyed shopping at Polarn o Pyret, you might also like to check out more great deals on children's clothing and more at stores like Mothercare or Babies R Us. Or, if those aren't right for you, you'll find plenty more deals to browse in our Baby, Kids and Toys section. Standard UK delivery is free on all orders over £25. For orders under £25, a delivery charge of £2.50 applies. If you need to return a product for any reason to Polarn o Pyret, you can do so by simply returning your items in their original condition within 28 days of receipt. Need to speak to the team at Polarn o Pyret? 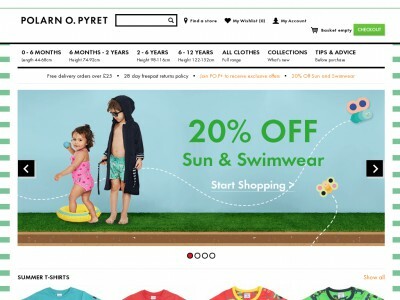 Whether you have a question about your order, want some expert advice on choosing the right clothing for your child or just want to find out more about how you could make big savings with a Polarn o Pyret discount code, you can contact the Customer Services department by accessing the online contact form here. Want to discover more from Polarn o Pyret? Why not follow the company across your favourite social media sites? You'll enjoy access to lots of interesting content including competitions, special offers, children's entertainment ideas and more. You can also use these pages to find out more about saving money with a Polarn o Pyret voucher. Don’t forget to check them regularly, as you can never be sure when a free Polarn o Pyret discount code might be waiting for you! Buy now online at www.polarnopyret.co.uk. When I was expecting, I hated the idea of pink for girls and blue for boys. Then I discovered a Polarn o Pyret discount code online. At polarnopyret.co.uk you can shop for a range of unisex clothing for babies and children – all available at a great rate with a Polarn o Pyret voucher. I used my Polarn o Pyret discount code to get a great deal on a set of cotton bodysuits that looked as great on my boy as they did on my friend's baby girl. So see what you could save with a Polarn o Pyret voucher!